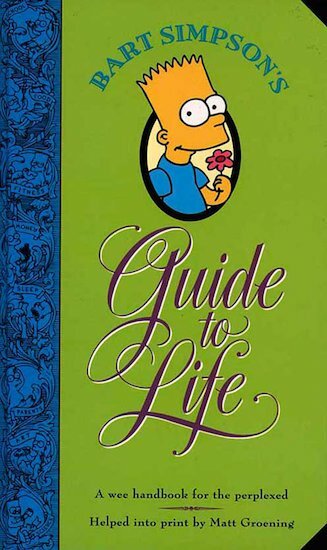 The one and only Bart J. Simpson shares all his cheeky wit and worldly wisdom in this hilarious guide, full of terrible tips on homework, school, families, religion, art, health and life in general. Try Homer’s Dozen-Donut-A-Day Diet! See why the scent of chilli dogs makes women swoon! Discover Dr Bart’s Miracle Cures (if you dare!) In frantic full colour, this book gives you the hard-knocks facts of life from the guy who’s seen it all, heard it all, done it all – and denies it all! This book is hilarious. I enjoyed reading it so much. The part of the book is when Bart is giving 50 ways to annoy your parents. I espicialy liked Bart’s dream bedroom Lisa’s bedroom was okily dokily(haha). It is one of the best books I’ve ever read even though I’ve read it about 20 times. I aslo enjoy over Simpson books!